Rather than speaking about C.S. Lewis, we will let Jack speak about himself through his letters: what he loved, such as books, seasons/weather, walking tours, "bathing," Ireland, animals, convalescence, Joy, and writing; what he loathed: writing letters, Americans, cities, TV, newspapers, movies, modern novels/poetry/theology; what he feared; what he didn't understand; and what he regretted, as well as his descriptions of what he looked like, what he did well, what he did badly. I will force myself with Great Difficulty (because of all the choice bits I will have to leave out) to limit these tastes of his sixty-year three-volume, 3,600 page, 9-1/2 pound correspondence to what can be savored in twenty minutes! In the theology of C.S. 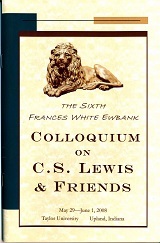 Lewis, God is rather verbose and unrestrained in the manners and means of communication. God must be understood as the speaking God; anything less will not do Him justice. The few extant works about Lewis's theology of revelation focus on scripture, and though this is an important topic, one cannot understand it properly without first understanding how God speaks in general. This paper explicates his epistemology as a foundation, and then under the rubric of basic communication theory (author, text, recipient, re-texting), presents eleven 'parascriptural' paths through which God speaks as mentioned in Lewis's writings. The term 'parascriptural' - 'para' in the sense of 'beside' or 'alongside of' - is used instead of 'General Revelation' because the traditional division between General and Special Revelation forces categories upon Lewis that are alien to his thought. After presenting these eleven paths, they are categorized and related back to his epistemology. The paper then finishes as it should, with tantalizing questions about what this means for understanding Lewis and why it is important in our own lives.